I encourage my students to write wherever feels most comfortable for each of them. As you can see from this picture, not all of them choose a table and chair! Just found your blog … love that you allow the children the freedom to choose wherever they wish to write. Nice to meet you out here. Dear Mrs. Cassidy’s Class, our teacher Ms. Lirenman tells us that once we start our writing program we will get to sit and write where ever we want too! 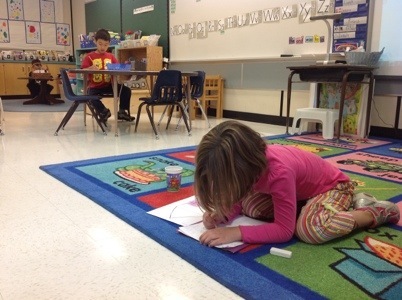 Where in your classroom is your favourite place to write? From Division 18, Surrey, BC. Canada.